Turn your loader into a powerful excavator with the powerful digging force of the Bob-Tach® backhoe attachment. 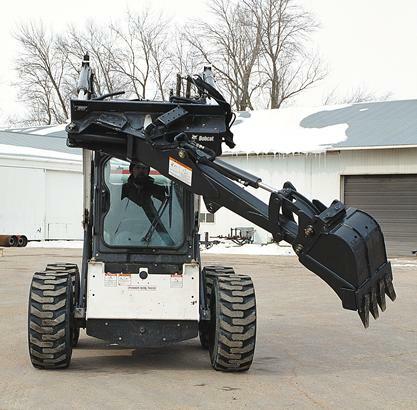 With the tight-fit attachment hook-up of the Bob-Tach mounting system, the backhoe mounts directly to the loader – no mounting kit or stabilizers required. Unlike other mini-hoe attachments, the backhoe is equipped with the ability to swing the dipper left or right 48 degrees. This delivers more efficient spoil dumping without having to skid the loader, allowing for more convenient operation and less overall ground disturbance. Cost-effective and convenient, the Bob-Tach backhoe is designed as a money-saving attachment for rental dealers, landscaping, nurseries, sewage system and septic tank contractors, water and power line contractors, and electrical contractors. Auxiliary hydraulics from the Bobcat loader provide to hydraulic cylinders on the attachment to dig, dump and swing without installing an additional mounting kit. Bob-Tach Mounting System: Turns any Bobcat loader into a multi-job machine with a tight-fit attachment hook-up. Fast and easy attachment changes means spending less time on maintenance and more time on the job. Clamp Compatible: Optional clamp provides added versatility by allowing packing up and placement of materials such as logs and rocks. No Mounting Kits or Stabilizers Needed: Use the backhoe without a mounting kit or stabilizers and attach it without tools. Dipper Swing: Allows the dipper to swing freely 48 degrees to the left or right, which reduces ground disturbance and eliminates time spent skidding the loader to dump the spoil. Excellent Down-Hole Visibility: Offers a clear visibility when operating backhoe attachment, allowing for more efficient and accurate operation. X-Change™ Mounting Attachment System: Multiple bucket widths and usage of some non-hydraulic X-Change attachments such as the ripper and packer wheel. Clamp: Optional clamp provides added versatility by allowing packing up and placement of materials such as logs and rocks.